Added Nuka World weapons and armor to the mod-able list. Removed FOMOD installer as it should no longer be necessary. Due to limitations in the CK I won't be able to implement the various options to my satisfaction so I've currently removed them from the download. Free is still available. Perhaps at a later date if I can find a proper solution to the implementation I desire I will revisit those options, until then that're going on the shelf so I can work on other mods. I will however be keeping this up-to-date for Nuka World as well as providing support for popular requested mod compatibility. UPDATE: Caps and Perks options are currently borked but Free will work just fine. Until such time that I discover a way to implement those features to my satisfaction they will remain unpacked in the download. Note the strikethroughs are for placeholding the information until such time that they are re-implemented. Greetings and well met fellow Vault Dwellers! Here I will explain all the features of this mod. In summary, this mod supports any combination of DLC - which was made easy with the use of Wenderer's FOMOD Creation Tool! There are four different options is one option to choose from; free, caps only, perks only, caps and perks. All options will be discussed in further detail below. 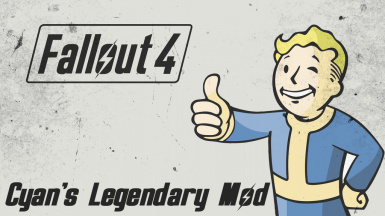 Additionally, this mod adheres strictly to the legendary mod and weapon/armor combinations set forth by Bethesda. Power armor additions will not be covered in this mod. This mod was built from the ground up to support all current content of the game. Simply copy "Cyan's Legendary Mod.esp" to your Data folder. Free - Allows you to freely add and remove legendary mods of all types without any cost or other requirement. Caps Only - Removing legendary mods now requires caps to remove. Costs vary based on type, slot, and general power level. Perks Only - Removing legendary mods now requires certain perks to remove. The required perk depends on the item type, requiring either Gun Nut, Blacksmith, or Armorer. Mods that apply to both melee and ranged require either Gun Nut or Blacksmith, and those that are Tier 4 require Blacksmith 3 due to the fact that there aren't four ranks of the perk. Melee builds get a free bonus as a result. Caps and Perks - Removing legendary mods now requires caps and requisite perks to remove. Weapons: All mods require 1000 caps to remove from weapons, with the exception of Poisoner's (250) and Incendiary (500). The latter two require less due to their effectiveness as the game progresses relative to others. Armor: All chest-exlusive mods require 750 caps to remove, while all other mods typically cost 500 caps to remove, with the exception of Duelist's and Safecracker's which both require 250. The latter two require less due to their general usefulness relative to others. Each mod has a certain tier listing; 1-4. Each tier corresponds to the rank of either Gun Nut, Blacksmith, or Armorer respective of the object type the mod applies to. Caps and Perks combines both options into one with no differences.